Joel Goh graduated from California’s Stanford University in 2006 with co-terminal Bachelor’s and Master’s degrees in Electrical Engineering, then in 2014 received his PhD in Business Administration, also from Stanford. In addition, Joel served as a student leader in Stanford’s Chi Alpha ministry under the guidance of campus pastors Glen and Paula Davis. After finishing his doctorate, he went on to serve as an assistant professor at Harvard Business School, a position he held until this year. 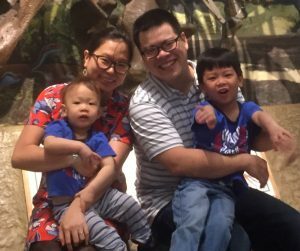 It was then that he and his wife, Tam, and their two sons, Jonathan and Timothy, returned to his native Singapore so Joel could begin teaching at the National University of Singapore. Indeed, Joel has been making an impact for Christ in the University, the Marketplace, and the World! Joel shares how Chi Alpha prepared him for his teaching positions and his first-hand experience of what it is like being an international student in the United States. I first joined Chi Alpha as a sophomore in college. For me, Chi Alpha felt, in a way, like a home-away-from-home, a community where I felt included, where I could serve, and grow spiritually. Glen and Paula played a big role in this. I felt they truly cared for us as individuals, and it was their authenticity in relating to us that made me (and I believe others too) feel this was a community that was worth investing our lives into. What was the American college experience like for you as an international student? My college experience was quite different than my grad school experience. The early years of college was a bewildering time for me. Back then, before college, my only glimpse into life in the U.S. was the curated version that Hollywood had presented. It took me a while to intuitively grasp how my American peers were thinking and to understand what mattered to them. I don’t think I fully appreciated or made the most of my college years, in part, because of the magnitude of this culture shock. By the time I was in grad school, I was quite a bit older and having spent my college years in the U.S., and having the benefit of time, enjoyed the social experience in the U.S. quite a bit more. Of course, in grad school, I spending most of my time pursuing research in an area I knew I was really interested in, which is inherently enjoyable, and perhaps this colors my view even of my social experience then. How did Chi Alpha prepare you for your teaching position at Harvard? Glen and Paula exemplified for me the impact of investing in people. I think what made Chi Alpha different to me was that I never felt like a “project” or that they were building a “brand” around themselves or even the Chi Alpha organization, but that they simply related to us with authenticity as individuals and invested their lives in us. For me, this is something I try to carry into my professional life both in teaching and research. I aspire to see the individual, the person, in all my work. At Harvard Business School, I used to teach classes (sections) with approximately ninety students in each section. I aspired to avoid viewing them solely as a single collective body, but rather to view them as ninety unique individuals, each with his/her unique gifts and challenges, hopes and fears, triumphs and struggles. I also felt in Chi Alpha, we as a community always strove to bring out the best in each other. I lead my professional life with a similar goal: to not only help my students learn the course material well, but more broadly to help them to thrive. I say these are goals/aspirations because I don’t always achieve them, and am myself on a continual learning journey of how to become better at this. What advice do you have for other Chi Alpha Alumni who are called into the marketplace? We are all called to be the salt and light of the world in whatever we do, and for me, it has always been encouraging to remember we are partners with Christ in making the world a better place and I hope this encourages other alumni too.